As the weather grows cooler and you look for meals to warm you up, try this hearty vegetable beef stew. Full of beef and vegetables it’s perfect for a weekend lunch or weeknight dinner during autumn and winter. Leftovers, if there are any, are easily reheated on the stove or in a microwave. Taste for seasoning before serving. I usually like to add a little pepper. Often I’ll serve this stew with cornbread muffins, Pillsbury crescent rolls, Hawaiian rolls (a favorite with my kids) or a nice crusty French bread. Sprinkle steak with salt and pepper. In a Dutch oven, brown steak in batches in oil over medium heat. Remove to a plate until all beef is browned. Return beef to Dutch oven and add broth, potatoes, water, carrots, onion soup mix and remaining pepper, bring to a boil. Reduce heat, cover and simmer 20 – 25 minutes or until vegetables are tender. In a small bowl combine cornstarch and remaining broth, until smooth. Stir into soup. Add peas. Bring to a boil, cook and stir 2 minutes or until thickened. This entry was posted in Appetizers, Beef, Comfort Food, Pot Luck, Soups, Sunday Dinner and tagged Beef soup, beef stew, carrots, peas, potatoes, sunday supper movement, Top Sirloin, vegetable beef soup. Bookmark the permalink. 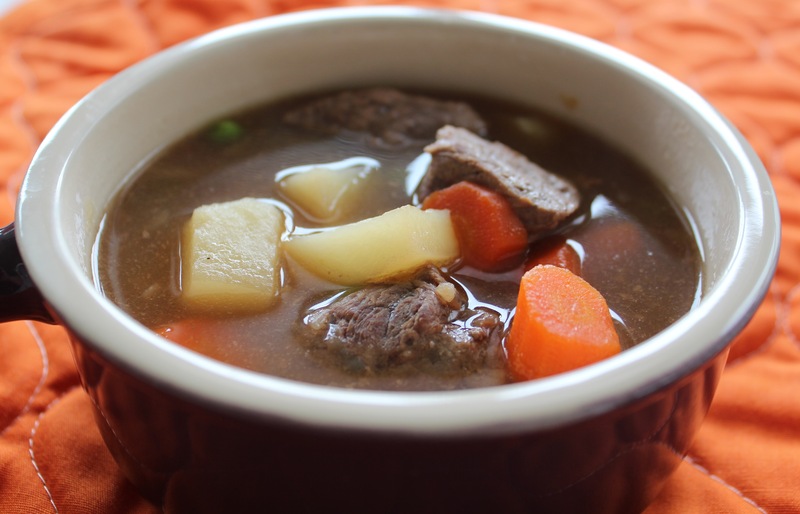 Traditional vegetable beef stew is always a hit here, and your looks fantastic! Such a delicious classic! I need to add this to my autumn menu!!! This recipe is perfect for cooler day, Liz.